Description: A photo with no real story behind it, just trying to get back into the photography swing of things! Fantastic shot, love the blue lighting. I only have the ROC version of the snake. It's an ok toy for what it is, someday I'll pick up an original. I hated my SNAKE too. I had V1 Destro for about all of 45 minutes. The Stinger Driver was one of my first 4 Cobras (still have him!) and is my favorite "unnamed" to this day. I hated the SNAKE as a kid. And, we got like 3 of them for various presents. (They must have been cheap gifts!) But, it's growing on me and is making its way to the 2018 acquisition list. I love the depth in your shots. I used to think it was the dumbest looking thing too! I would've never grabbed it if it weren't for the cheap ROC repaint they made. After that, the design really grew on me for it's retro aesthetics. This is a sweet shot RTG! Sometimes a shot is better without a story if it's just nice to look at. I think it helps with the "catalog" feeling, that sells the toy more so than tells a story. I've never had a SNAKE or a v1 Destro, but they look great here. 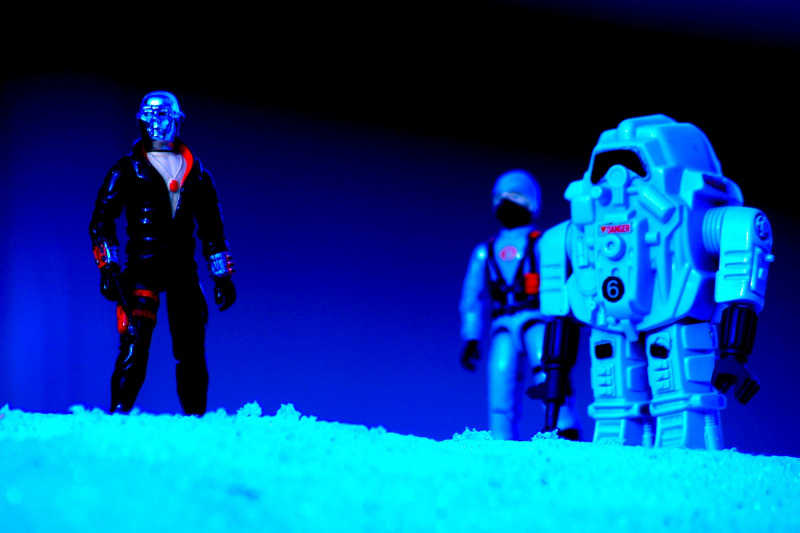 I know it's an 'outside in the snow' shot, but it really has an otherworldly glow to it-- perfect for a science fiction contraption like that power armor. I love it!